We all know how it feels to be bullied at some point in our lives. Studies have shown that one out of every four children are likely to be bullied at some point in their lives – which means that it’s almost unavoidable. No one knows more about this than Shaholly Ayers. 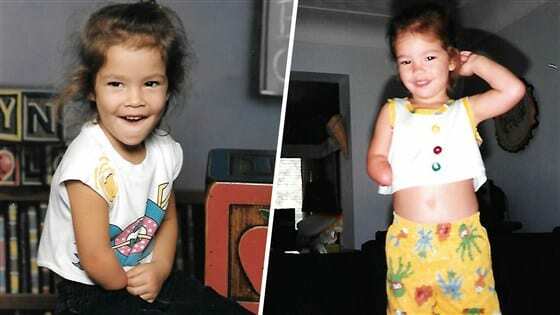 Shaholly was born with what is formally known as congenital amputation, which basically means that she was born without an arm below her right elbow. Because of this, Shaholly lived the majority of her life expecting to hear the word “no” quite often. Because she heard the word so regularly to so many of the everyday things she wanted to do, it became a part of her personality. She was even beaten up by a kid when she was younger just for being an amputee! But Shaholly had hopes and dreams like the rest of us. Shaholly had always dreamed of becoming a model, and this is what she set out to do. She had approached a number of different agents in the town she was living in in Honolulu, Hawaii and all of them had turned her down because of her amputation. She had become disparaged and wanted to give up. But something clicked in her at that point and she decided to go on with modeling – without an agent! For a newcomer to the industry, this is pretty drastic, as there’s a lot to do in order to get jobs and being alone makes this already difficult job all the more complicated. Shaholly had to be creative, but in the end, it paid off! She had managed to create her own, unique portfolio and had acquired a pretty impressive list of companies that she had modeled for in the New York Fashion Week for six consecutive seasons as well as Nordstroms. To say that this is a monumental achievement for someone with the challenges of Shaholly is an understatement. Well done Shaholly!